Our group camping trip is less than two weeks away! I’d like for all of us to make the pledge – no electronic activities! We’ll all unplug for the weekend – kids and adults included. (of course we can have the phones for safety/emergencies, coordination if needed and for taking pictures) Here are various activities we can look forward to. The beach at Sibbald Point is really nice and shallow for quite a distance from shore, which is really nice with the kids. The shoreline can be a bit rocky underfoot, but once you get past the two feet it’s fine. Also depending on the weather and temperature of the lake, it can be weedy at the shore, but again once you’re past the shore it’s fine. There are “comfort” stations nearby too so there are flush toilet facilities and sinks not far away. We plan on bringing a beach umbrella to provide some shade on the beach. There a few playgrounds in the park, but the largest one is next to the beach. The kids have always had a lot of fun there, but note that there is little shade so it gets hot in the afternoons. The park also puts on different programs in the amphitheatre, in the museum, and fishing program on the docks. I’ve been trying to see whether they post the program schedule online, but haven’t been able to find it yet. Who wants to launch some air-propelled rockets at camp and learn the basics of aerodynamics? Of course you do. Please bring an empty 2L PET pop bottle for each kid (and maybe adult? ), and if you have duct tape and cardboard too, that would be excellent. These would be used to fashion fins and decorative elements. Tai recently got this aquapod rocket launcher and is pumped (pun intended 🙂 ) to try it out with the kids. Thinking we might do this on the Friday afternoon when many of you are arriving so we keep the kids occupied while you set up your camps. Of course, we can keep using it through the weekend. What can you do with a little glycerin, dish soap and water? We will be bringing our bikes to bike around. The girls have gotten their training wheels off so we want to make sure they keep practicing! It also makes it handy to get to the washroom. I learned from last year to have pictures included so the little ones who can’t read yet can participate without the need for an adult. We can pull this activity out whenever the adults want the kids out of our hair for a bit and relax. I’ll have the paper bags for collection and printouts of the hunt items. So you can learn how to do this too for future camping trips. 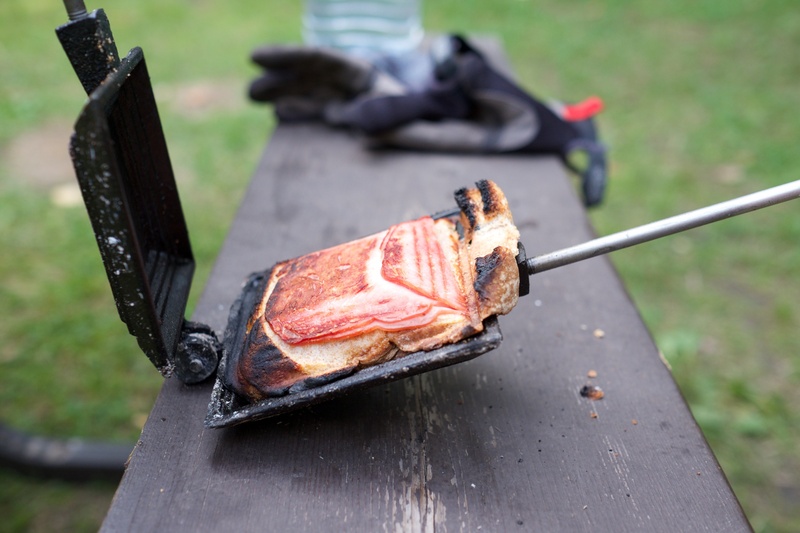 Scalloped potatoes, pineapple upside down cake (a cheated version) and other delicious items can be done by you too over a charcoal fire! While I’m crossing my fingers that we will have amazing weather for the 3rd year running, we’ll have some rainy day backup ideas just in case. We’ll have one canopy tent to provide some shelter and we’ll try to mount a tarp as well. But do make sure you bring rain gear. knot tying / braid practice – Never too early to learn how to tie different knots and braids, right? I have a cheap rope from dollar store we can cut up. I think the big lesson learned from last year was I had overestimated the amount of everything I planned for food. Considering how close the Sibbald Point Provincial Park is to a town with a grocery store, there is really no need to bring more food in case we are hungry and need more food. Yes folks, it’s t-minus 4 weeks to our big camping trip for 2015! We are getting excited here in the Toh household. I hope you are too. I’ll update the post as we get more information or in response to questions. You can also leave comments/questions to the relevant post so we don’t have a crazy email thread to weed through. We also felt constantly tethered to our site and needing to have meals ready for certain times because we felt a kind of pressure to ensure food was ready for hungry kids. Also every family ends up having a slightly different schedule so it’s hard to make one food schedule work for everyone. 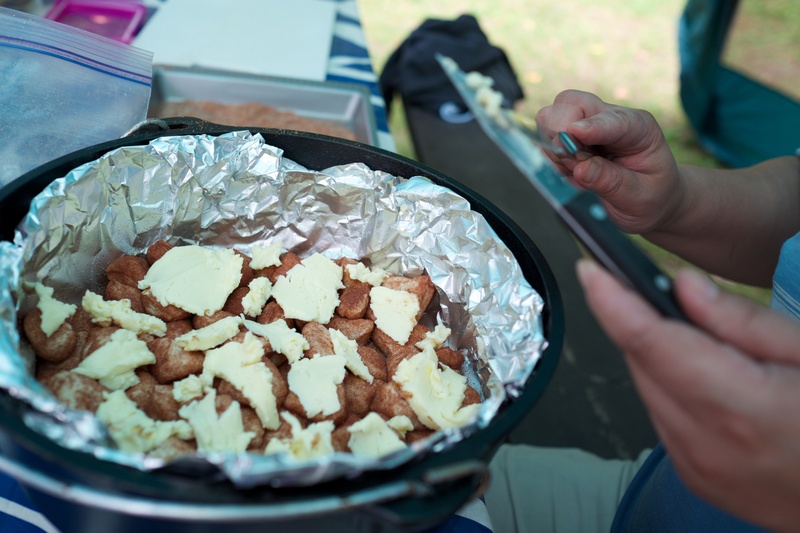 the novelty of having the dutch oven and cooking over the campfire wore off when we realized Tai was the only one comfortable with cooking this way and I had planned too many menu items with this cooking method. He was constantly having to be at the campfire to tend to the charcoal. In response to that, this year we will host one big group dinner, and then the remaining meals we can have two options: 1) leave each family camp site(s) to arrange their own meals; or 2)have the meal host location and preparation rotate around to others’ campsites- sign up for hosting one meal with one or two other families. Since many of you are arriving on Friday, our twin sites 221 and 224 will host Friday dinner so you won’t have to worry about it this first night. (this is a change from my initial claim of hosting Sat dinner) I’ve assumed breakfasts are all DIY. Nervous about food planning? Don’t be, I’ll share our camping menu and if you don’t have the camp cooking equipment you can either rent it, or come cook at our site. So first step: go fill in your meal logistics preference here. (note: you will have to log into the Google Sheet with your email so you can edit the sheet).